Anderson Silva is one of the biggest names in all of MMA, but No. 1 middleweight title contender Chael Sonnen is the reason why people will shell out $44.95 to watch UFC 117. Sonnen has used every media opportunity to verbally lambaste the world’s best 185-pounder, much to the delight of comedy-seekers worldwide. However, the biggest winner after the August 7th showdown won’t be the fans, it’s going to be the UFC. The Oregon-native has made this pay-per-view event a must buy with his outrageous pre-fight chatter. In the fight card’s official trailer, Sonnen is basically featured as the narrator throughout the clip, while only glimpses of Silva are thrown in. Sonnen is one of the few to ever publicly trash talk the man who quite possibly could be the best pound-for-pound fighter in the world, and he doesn’t always need a camera to call him out either. Sonnen chased “The Spider” down during the UFC Fan Expo in Las Vegas this past May and can be heard spewing some venom at the champion while a fan captures the magic. In one final push before this weekend’s highly anticipated scrap, Sonnen continued to make moves towards becoming the sport’s best promoter (sorry Dana), as Joe Rogan spoke to him via satellite during “UFC on Versus: Jones vs. Matyushenko” to remind fans of why they need to watch UFC 117. Love ’em or hate ’em, both “The Spider” and his challenger have the ability to sell fights and Saturday night’s extravaganza will be no different. 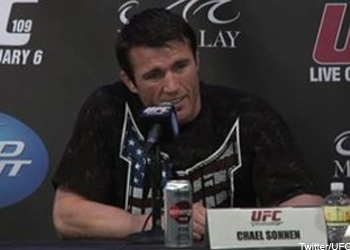 The question is, does Sonnen have more bite than bark?